New Year, new videos! In 2019, we’re going to be making incredible projects with our enormous library of crafting items. 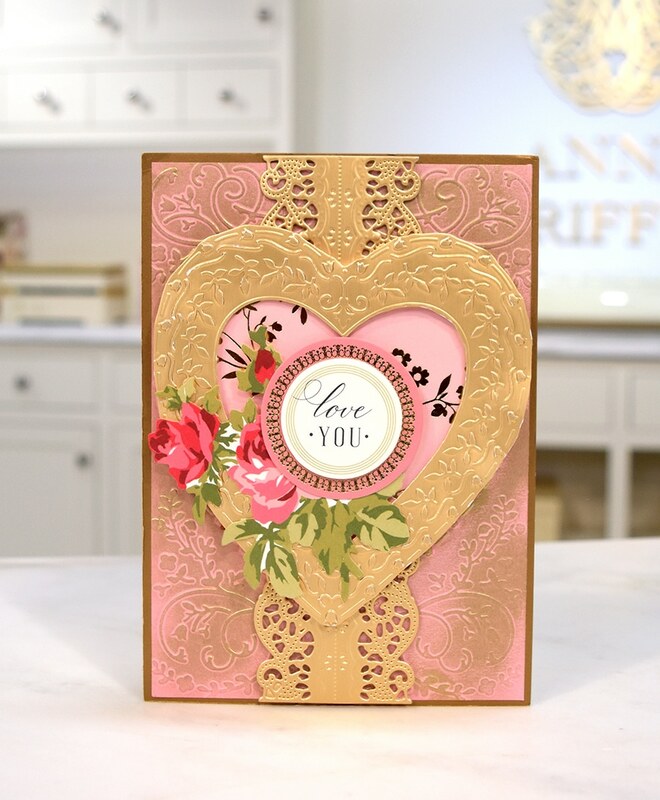 Since Valentine’s Day is right around the corner, we thought that making easy, elegant Valentine cards would be just the thing to kick off our new Tutorial Tuesday segment! So, whether you need to make a card for your husband, daughter, cousin or friend, we’ve got you covered! 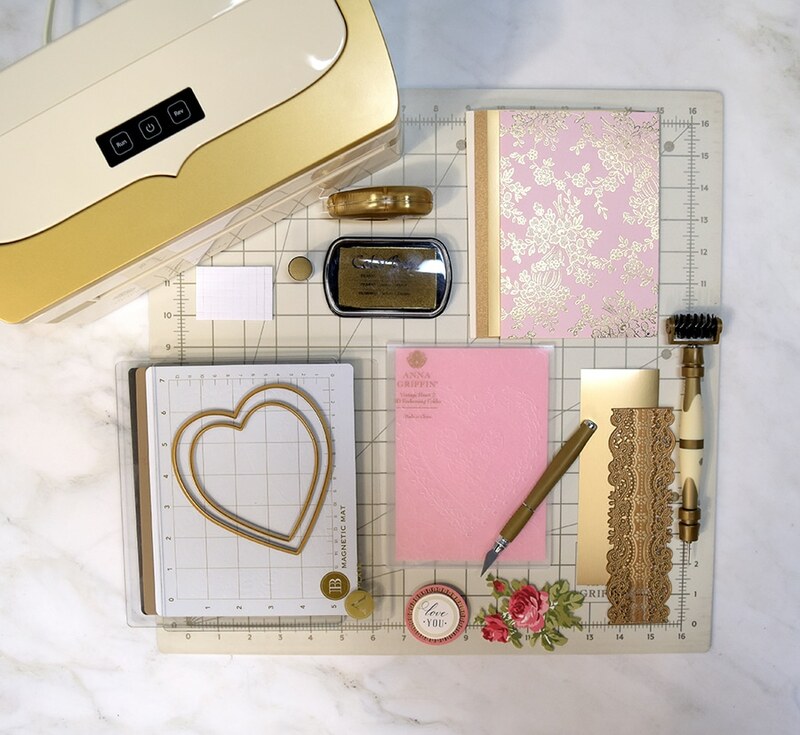 Even though some of our Valentine’s Day items are sold out on HSN.com, one really great thing about today’s post is that the Valentine’s Day embossing folders and dies are actually available on OUR WEBSITE! 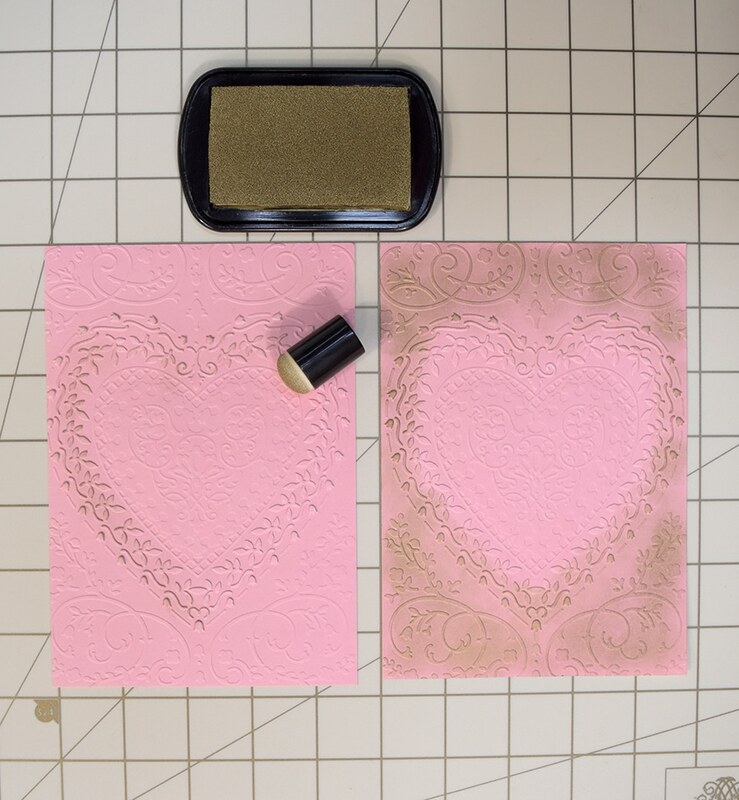 We linked you to the Vintage Valentines Folders/ Dies, Valentines Doily Cut and Emboss Dies here and in the materials section (of the instructions). Just hover over the item, and click to be taken to the product! Using the Empress machine and the largest embossing folder, emboss the pink cardstock. 2. Using the largest heart die, die cut the 5”x 7” piece of gold foil cardstock. Then, emboss the heart using the largest embossing folder. 3. Using the Empress machine and the Lace Edge die, die cut and emboss the 2 ½”x 7 ½” piece of gold foil cardstock. 4. Die cut the Foil-Stamped cardstock using the smallest heart die. 5. 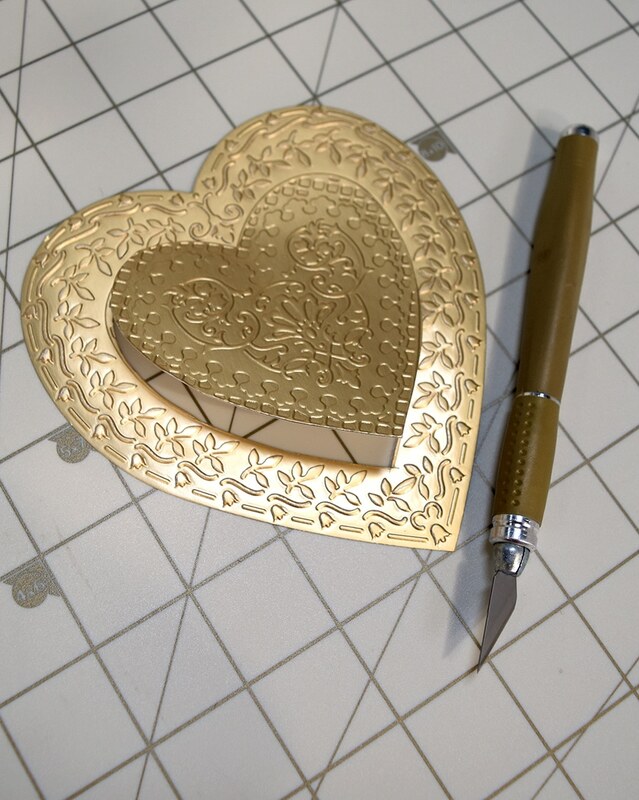 Using a craft knife, fussy cut the center of the gold heart embossed layer. 6. Using a dauber, apply gold ink to the pink embossed cardstock layer. Using double-sided adhesive, attach the gold metallic cardstock layer to the 5”x 7” card base. Attach the pink embossed cardstock layer using double-sided adhesive. Attach the gold lace border layer to the center of the cardstock using foam squares. Adhere the gold heart frame using foam squares. With foam squares, attach the rose embellishment and sentiment. 1. Using the Empress machine, die cut the paisley cardstock with the small rectangle doily die. 2. 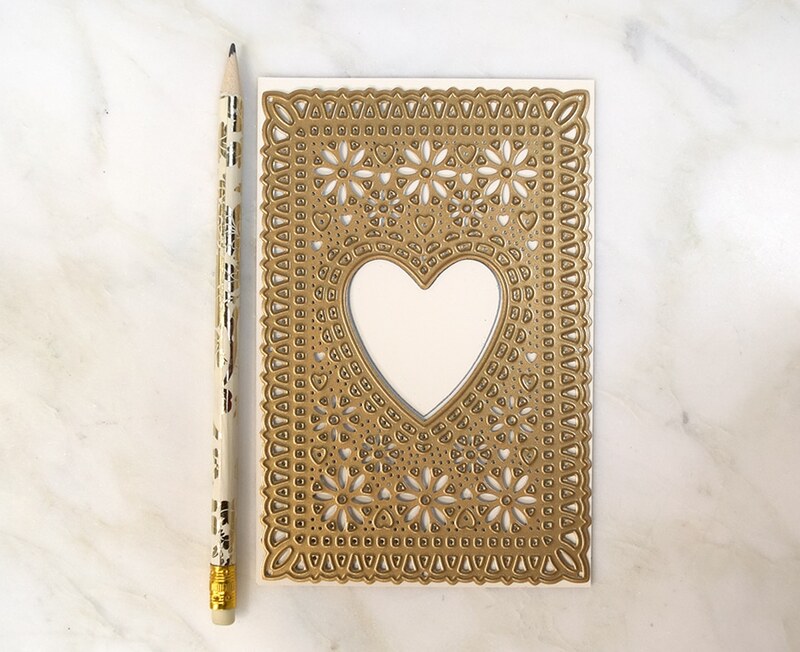 Die cut the 3 ½”x 3 ½” piece of gold cardstock using the matching doily heart die. 3. Center the paisley cardstock die cut piece with the back side of the remaining gold foil cardstock. 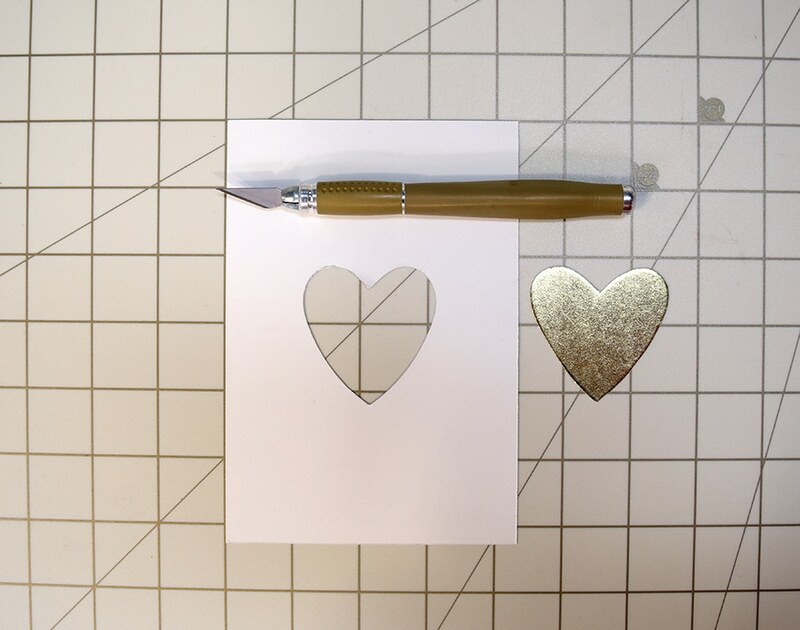 Using a pencil trace the inner heart to the center of the back of the gold foil cardstock. 4. Fussy cut the traced heart using a craft knife. 5. Fussy cut the center of the gold foil cardstock die cut to match the heart in the center of the other two layers. 1. 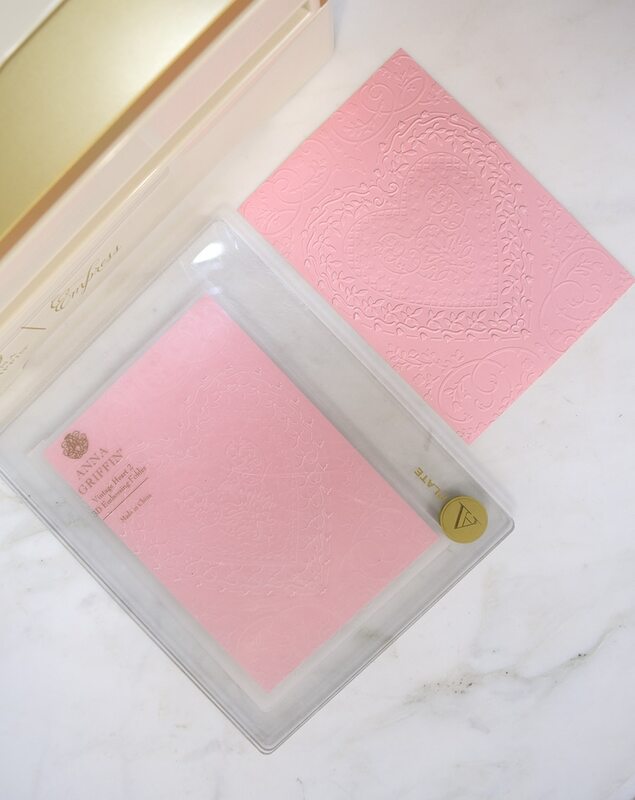 Using foam square adhesive, attach the 4 ¼”x 6 ¼” piece of gold cardstock to the pink and white card base. 2. Adhere the paisley die cut piece using double-sided adhesive. Align the hearts. 3. Align the small gold die cut heart on top and adhere using foam squares. 4. Attach the flower embellishments, bow and sentiment with foam squares. Both of these beautiful cards can be made with the papers and embellishments you have at home. We think that is great! There are lots of amazing tutorials planned for you in the next few months but we are taking requests! Let us know what you want to learn and your wish might be granted! 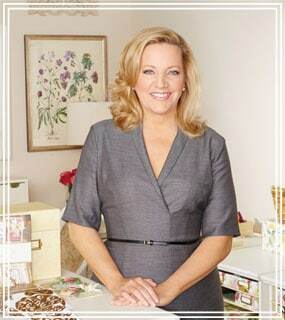 Don’t forget our upcoming appearances on TSC 2/6, QVC UK 2/12, our amazing Warehouse Sale on 2/12 and our HSN shows on 3/5. The pink and white card base 5×7 that you are using in this example is that something cut out of a 12×12 or actual precut card bases that you offer in one of your kits? 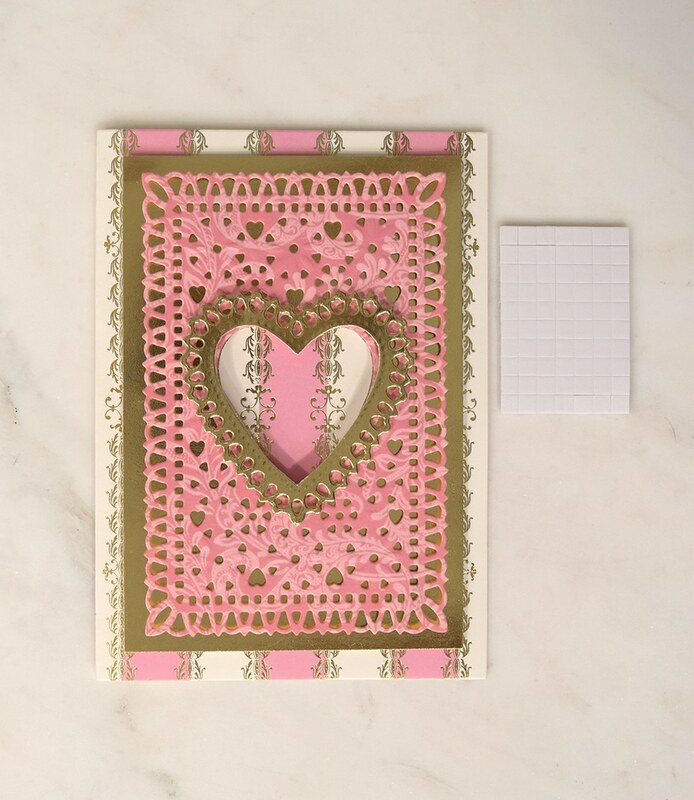 It is a card base, but you could make them with the cardstock: https://annagriffin.com/product/vintage-valentines-pink-striped-with-foil-cardstock-12×12/. What is the double-sided adhesive you use or recommend? We use different adhesives based on the project. We use our tape runners, tape runners from Thermoweb, tear tape, etc. Beautiful cards, what size paper do you use to make 5×7 vertical cards? You always refer to them and show them but the longest paper I have is 12×12..very frustrated, please help. These are all just so beautiful – imagine getting one of those in the mail – those dies are a crafter’s Valentine dream. Loved the tutorials, especially the vintage die set. So well in fact I ordered it. The Tutorials are a great idea!!!. I do have a question, the alphabet die set sold out before I could purchase. Hopefully they’ll be returning. I tape all your appearances on HSN so I don’t miss anything. They in themselves are great tools. I am new to your blog but not to your card making. I simple love all your projects. I bought the cricut maker to enhance your style. I would like to be able to buy your fabrics as seen on the project .I have 5 smal granddaughters and would love to make the quilts as seen on the project board. My favorite one is the one with the little deer sitting one the fabric. Is the fabric sold on your website? I’ve not been able to find it. Any help would be greatly appreciated ! Anna…..will there be an Amazon sale this year? I love all of Anna’s tutorials. They are so helpful for a newbie like me. I even watch her old YouTube videos. Her tutorials are just like her – timeless, classic and never out of style! Thank you Anna for taking time out of your busy schedule for all the great tutorials to use with your products! Please bring back your essentials craft tools! Every time I see the beautiful mat and tools – I get gold with envy!! These tutorials inspire me to get busy and get my Valentine cards made and to do couple scrapbooking pages! Anna, loved the tutorial. Great to see even more what we can do with our dies for the next season. You never stop amazing! I placed a order. But ask me to enter again. The card are stunning and I am amazed about the intricacy of the dies and embossing folders. The materials used were outstanding. Your tutorial was very informative as well. I loved it all!! Beautiful Valentine’s Tuesday with the lovely heat dies. Looking forward to making these for a loved one or for fan mail Friday! Hi Anna: I LOVE TUTORIAL TUESDAYS!!! JUST AS MUCH AS FAN MAIL FRIDAYS!!! Thank you so much for this BEAUTIFUL VALENTINES DAY tutorial. I can’t wait to go into my craft room and bring out all of your beautiful papers, dies, hearts and have FUN FUN FUN creating!!! God bless you, Anna, for your kindness, generosity, creativity and inspiration that you share with us! YOU ARE SO BEAUTIFUL! beautiful cards and ideas Anna. Thank you for all the inspiration that you give us to make all these beautiful cards. Thanks for the step by step card making. Also THANK YOU with all my heart for the BIRTHDAY CARD. It was such a surprise. My day is the 19. MY FIRST CARD received. These are lovely. I enjoyed the tips as you went along. I don’t have these dies, but I think I have enough of your papers and other dies to make something similar. Looking to your video’s and products. Happy New Year to you and your staff. I hope this is the start of a new idea book. Everything you do is beautiful. Thanks for the Tuesday Tutorial! Something to look forward to seeing each week! I had to search through my dies & folders to make sure I had everything. I have so much of your beautiful things that it’s hard to keep up with what I have even though I have them stored in your wonderful notebooks and folder boxes! (I’ve been lazy and haven’t put labels to designate “what’s in what” yet, as I really enjoy looking though and seeing all the amazing things you have offered us in the past.) Love your new Valentine card kit! It’s been fun adding some of your die cuts, especially the “lace” ones. Thanks for all you do to make our lives and others beautiful! The cards are simply gorgeous! You have made me look at some of my dies with different possibilities. Very creative and made with love, perfect for Valentine’s Day. I am a new manager of a low income senior community and I wanted to do a protect with my residents At first I thought Mother’s Day but then after seeing the video I said BINGO.!!!!! The residents here have never made any cards let alone using a Empress. I am so stoked about outr up coming card making day. Hi Anna: tks for the tutorial for Valentine’s day cards , the samples are beautiful. I am inspired. cards. I already purchased the Vintage Valentine set of folders and dies and once they arrive the first card I will make is the one on this tutorial. Thank you so much for the new day of the week Tuesday Tutorials….can’t wait for a Tuesday and can’t remember the last time I said that…..
Have a joyous week and to all the Griffinites, be blessed in all that you do. You are spreading love and thoughtful gestures to all you know. Those are so Beautiful in the making!!! I cannot thank you enough, Again. I would have never thought of this. I cannot wait to make these. I think, and this is hard to say because all your things are my favorite things, but this whole Valentine set is so beautiful and elegant, it has to be my favorite…..at least it is way up there on top with so many others. Anna, after watching this video, it made me wish you would sell something like “Simply Sayings”. Sayings in an individual grouping for birthday, holidays, etc. Not all sayings for all occasions grouped together but a single grouping just for a specific event. Why, you may ask? Because I never seem to have enough of one kind of saying, like just Valentine’s Day, when I make a lot of cards in that category. Hope I’m making myself clear. Thank you. Love your products. How can I get a set of the jacket dies, I purchased the holly one, thought I had it on auto ship, but it does not show up on my auto ship. Also how can I order a set of the heart folder and dies. The Holly Jacket Die was made for our Create event. The Jacket Die autoship was sold on HSN October 9th of 2018. Those will be coming back to HSN this Spring, so watch for them! The Heart Folders and Dies are available here on our website under the crafts category. Very beautiful. I laid out my valentine dies, etc. last weekend. Papers, embossing mats, card layers, and more. Tons of beautiful things from you. Will work on them this week. These are such pretty cards. I love the candy-box look. When I was a girl I made elaborate dimensional Valentines with felt tops to try to look like a box of candy, with a small oval cut out of the middle so you could peek in and see a scene. These remind me of those, and I can’t wait to make some cards. Just have to get the craft room re-org done. Thanks for the tutorial, Anna! Yaaaaaaay! That was sooooo much fun, Anna! Thank you for teaching us! I could watch you all day and night! It’s so wonderful of you to take some time out of your crazy busy life to teach us! Got my Valentine dies Tuesday and I have to say I am thrilled with them. They are more beautiful than they are on HSN. I can’t wait to use them. I actually had the die set laid out but hadn’t used it yet, and very happy with the ideas you’ve demonstrated for us today!! Actually, I have every product you used, as I love Valentine’s or Hearts for my cards, as stated, we can use those all year long!! Loved it, eagerly awaiting your tutorial for next Tuesday! This was wonderful to have you show us your ideas on how to use some of your beautiful products. I can’t wait to purchase a few items. Thank you and your amazing Team who are coming to our rescue with design ideas and tutorials to make the most of your incredible materials! It inspires me. So looking forward to Tuesday’s with you. I’d love to know more about composition of a design on a card or scrapbook page. Perfect indoor snow day fun! Thank you. So fun to watch the cards being created. I am working on my firsts as you mentioned. Now I have really challenged myself. Thanks for sharing all the tips for card making. Beautiful cards and I love this segment. I can’t wait to try out my dies and embossing folders for this technique. Thank you Anna. Beautiful cards! Thanks for the tutorial on how to make them! I am really going to enjoy technique Tuesday! I’m so glad you started Tutorial Tuesday. It’s wonderful and I’m going to enjoy making cards with you. They’re beautiful cards. Bless you Anna. I love this and watching your tutorials, Thanks Anna! Thank you for doing this Tutorial Tuesday. Many of us have a huge investment in your products. We get so excited at our possibilities to create. Then that box of goodies gets delivered, and we start frantically searching for what inspired the purchase to begin with. I think this will go a long way in fostering our creativity. In fact, when this video started, I paused and went to my stack – these folders are so beautiful, surely I bought them…. Yes I did! I am so excited for tutorial Tuesday. I cannot go out for classes and paper clubs right now, this is so timely. Thank you for doing this for us. Both cards are beautiful. I am going to order some supplies that I don’t have & make them as soon as they arrive. Thanks Anna for this tutorial! I love your tutorials!!! These Valentines are absolutely gorgeous! I can’t wait to get my dies out and start creating ! I will run out of time before I can possibly deplete my stash of beautiful Anna Griffin papers and embellishments. I love everything you design and create to make our world a more beautiful place…. These are like yummy boxes of Valentine’s candy! 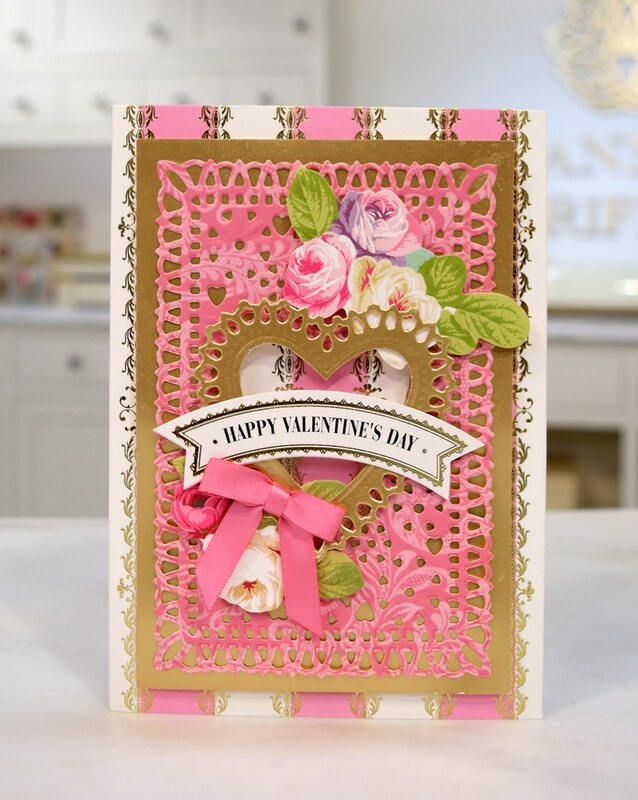 The valentines-doily-cut-emboss-dies are beautiful! Love the Empress machine!! Love your dies and card making kits!! These heart cards are beautiful Anna!! Thank you. Such beautiful Valentine’s Day cards! Thanks for the inspiration! Liked the tutorial, pretty cards, looking forward to more. Loved the tutorial!!!!! Thank You !!!!! So beautiful! I know I want to start making mine soon. Thanks for the inspiration! Looking forward to each Tuesday. Helpful tutorial Tuesday’s! I very much enjoyed watching the Valentine tutorial and am looking forward to more tutorials each Tuesday. Thank you, Anna! I love Tutorial Tuesday, what a great accompaniment to Fan Mail Friday! The Valentine cards are beautiful, thank you for the inspiration! Have a safe trip to Canada and the U.K.
beautiful I love the tutorial. Since I don’t have the dies you were using, I was anxious to start making my Valentine Day cards right away. I went back thru my AG stash and found some previously issued dies and embossing folders to start right away until my new ones arrive! Then I can make more cards! Thank you for the “Tuesday Tutorial.” The Valentine cards are beautiful. Looking forward to next Tuesday. Thank you for Tutorial Tuesdays. The Valentines’ Day cards are beautiful. You’ve inspirited me to start making my cards. Hearts 💕 love them they are soooo detailed will make beautiful cards or you can cut them out and use for decorations. I’m inspired now! -Well, you always do that for me! I love it, and I already love Tutorial Tuesdays! LOVE MAKING VALENTINES AND SENDING THEM TO MY LOVE ONES. HAVE LOTS OF ANNA THINGS TO WORK WITH AND I HAVE MADE 3 SO FAR. I AM NOT WAITING PATIENTLY FOR YOUR NEXT SHOW, Lol. BEST. 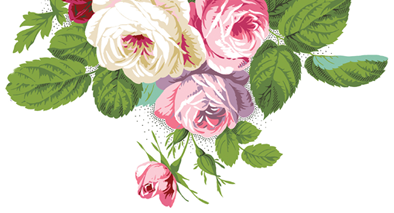 BONNIE W.
Terrific Tuesday Tutorials ! Love your Valentines. I am so glad I have these Heart Dies. Thank you so much! These cards are so beautiful. Thank you, Anna, for your tutorial valentine guidelines. I am about to start my Easel Card Valentines tonight. I love all of your ideas and products. Another great tutorial from Anna. You make everything look super easy. The cards are beautiful. Frequently purchase your card kits from HSN and have plenty of extra embellishments. Always receive compliments when giving one of your cards. Wow! What beautiful cards!! Gonna make one for my husband today! I would like if you could give tutorials on tricks and tips while stamping and few more different ways of using embossing folders. Love this new segment. Loving the vintage look of these beautiful Valentine ♥️ cards! I can not wait to get my hands on the gold cardstock and the embossing machine! What a beautiful lesson for all of us! You have such special dies to use and all of the papers make your Valentines so beautiful. Thank you for sharing great ideas with us. I can’t wait to try to make some Valentines my friends will receive with love from me. Wow,, those Valentine cards are gorgeous and I want to make some like it!! Thank you for showing us how. Thank you Anna! Tutorials are so helpful and FUN! Wow…this was great! Love the tricks and tips! Love the love! Thank you! Such a wonderful tutorial by Anna Griffin; I am truly inspired to better my crafting skills for all my projects. These two Valentines’ cards are beautiful. Wow these are beautiful! I love making Valentines Day Cards… I was a florist for 42 years and owned my own flower shop for the last 15 years of that. I am fully retired now and I love making cards… Valentines are my favorite to make because it is such a fun surprise to give someone a Valentines Day Card. It is really fun to make them and take them to a nursing home… Lots of Smiles and tears of happiness. As always your cards are beautiful! Oh Anna! Thank you, thank you and thank you for this tutorial. As a new crafter, this provides such inspiration and confidence to be able to make something beautiful. I am so grateful. I could watch this all day! I love “love” and can never be surrounded by tooooooooooo many hearts. Great tutorial Anna! Wow! Thank you ! “Seeing” you do this really helps to understand how it all works together …… aa a zing and beautiful!! This would be a great idea for Tuesday’s. Once a week or so, a lesson would be shown on using a new idea. I am thinking the teaching lesson would go on after Valentines Day. I would love, love this idea. I need lessons. Really enjoyed the tutorial. Thanks! I love the tutorial! It is great being able to watch the master at work. Thank you for sharing your expertise. The cards a gorgeous! It is so nice to see the pro at work showing how to use the products correctly. Tips are priceless to those of us that are not pros! Thank you. The Valentine’s Day cards are just beautiful. Thanks for the tutorial. I haven’t been able to correspond with you lately because my computer was disabled. I did use my phone a couple of times but found it too difficult. So happy to be able to view your blog once again. Spent a lot of money on HSN January 8th. Waiting for everything to arrive. I wish you could be on TV every day but I would probably go bankrupt. See you in March. Saving! Saving! Saving! I really enjoyed the tutorials and I look forward to more of them every Tuesday. I must tell you this funny thing…I kept waiting for and expecting an HSN host to interrupt at any moment LOL! Fantastic tutorial. Thank you. I love the level of detail you provided and it sure helps to see it in action. Thank you. Thanks for sharing your techniques Anna. I can’t wait to get started on making Valentine’s Days cards. These Valentine cards are beautiful! You’re so creative Anna! Lovely!! Im really excited for this new tutorial tuesday !! Oh, Oh….so looking forward to seeing more of these Tuesday Tutorial’s. Hoping to get the Empress one of these days. It’s so quiet and cuts such intricate dies clean. Looks like the machine for me. Now…time to go get these lovely Valentine embossing folders and dies. Anna first of all thank you for having this tutorials for us available. I am very new to making cards and this is so helpful. Thanks for the refresher course on card making, Anna. Your tutorials are always so educational. I wish I had the Empress & those dies to make these beautiful Valentines cards. The first thing that I bought from you was a beautiful valentine card set. This one is so beautiful and oh how I would love to have that new Empress machine. It looks wonderful! I am definitely making these. But first, two weeks into the new year and I am still packing away Christmas! These cards are beautiful, and I do have all the ingredients. These valentine cards and so pristine! Thank you! Love the Valentine cards. I just love Valentine’s Day! THANK YOU SO MUCH ANNA! YOUR TUTORIAL IS WONDERFUL AND INSPIRING! I was married on V-Day…I love sending out V-Day cards to share the love. Thanks for these ideas!! I’m off to HSN to get the heart dies I’m missing. Thanks for the order numbers! They’re not available on hsn.com, but they are avaialble on our website! https://annagriffin.com/product/vintage-valentines-folders-dies/ and https://annagriffin.com/product/valentines-doily-cut-emboss-dies/. Thank you so much for posting the lovely Valentine! I am making Valentines this weekend and can’t wait to try it! Love everything Anna Griffin! Very Pretty.hope they dont cost to much. Oh, I love Tutorial Tuesday! It is so nice to see how you intended for these items to be used. Of course we all have our way of doing things but to know how you use them is Great! Thank you for this and I’ll look forward to next Tuesday as well! Thank you again! I just wanted to thank you for the excellent video on making these cards. There were several tips, that I didn’t know and would be helpful to me. I know you try and keep these videos short, but I would not mind if they were a little longer, so you didn’t seem quite so rushed. These projects are wonderful and I just ordered the dies. Thank you again for doing this and I would ask you to continue these tutorials……as it can be quite helpful in learning to put projects together, maybe in a way, I would not think or technique to get a cool effect, etc. Thanks again! 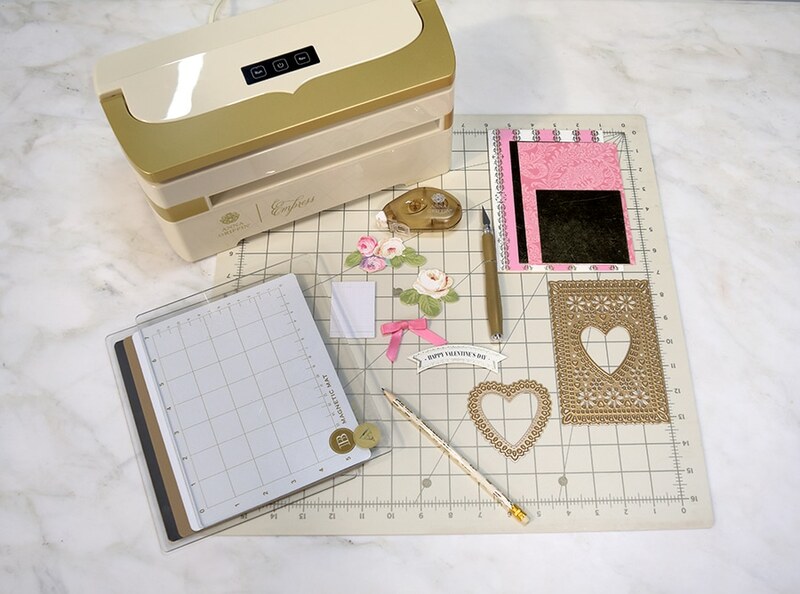 I’ve been looking for the embossing folders and heart dies since you sneak peeked them on HSN. Are they only available to purchase on your website? Wow – thanks Anna for the tips and tricks on how to achieve an “Anna-ized” Valentine! I hope you have the pink stripe paper on your website…I Adore that Pattern! Beautiful dies and embossing folders! Beautiful Valentine cards! After Christmas , Valentine’s are my other favorite card. With such materials nothing can go wrong! Very useful the tutorials ; it gives us many other ways to use dies and folders! Thank you Anna! Oh my goodness. How beautiful. Thank you for such a detailed tutorial, Anna. These cards are almost good enough to eat. Haha.